The tomato's red hue comes chiefly from a phytochemical called lycopene. Tomatoes have historically attracted particular attention from prostate cancer researchers because lycopene and its related compounds tend to concentrate in tissues of the prostate. Lycopene is a powerful antioxidant that has displayed anti-cancer potential in a variety of laboratory studies, stopping the proliferation of several cancer cell types including those of the prostate, breast, lung, and endometrium. Our 2007 second expert report, Food, Nutrition, Physical Activity, and the Prevention of Cancer: A Global Perspective, found substantial evidence that foods containing lycopene protect against prostate cancer. But in the intervening years, researchers have learned more about the nature of the disease, which has complicated the picture. Prostate cancer is not a single disease, but many – and many thousands of the cases now being diagnosed are cancers that may never become aggressive or life-threatening. Studies are only beginning to account for these crucial differences, which means any links between specific dietary factors and risk for prostate cancer have become harder to see. This is not the end of the story: We will add new studies on lycopene and prostate cancer to the CUP, which will be reviewed again before we issue updated Recommendations for Cancer Prevention in 2017. 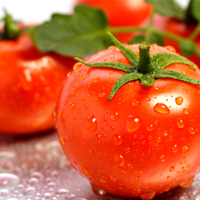 For now, though, tomatoes remain an important part of a healthy-cancer protective diet. They contain fiber, which has been linked to lower risk of colorectal cancer. AICR stresses the importance of eating a variety of plant foods to ensure the most protection against cancer development. No food in isolation can effectively lower cancer risk.